I was looking over my garden posts, and it seems like I’ve been posting much about how I kill off my plants in my balcony garden. That’s not always the case. I was able to harvest some “crops”, enough to make a meal or two out of them. Today I’ll show you my Diy planter, re-purposed from a clothing rack ( the expandable, wall-mounted type ). We bended some chicken wire to create a frame, then held it in place with plastic cable ties. Then, plastic mesh sheets were used to hold the soil ( just fold the short sides to overlap into a triangular shape and poke toothpicks through the holes to hold the sides in place). For the soil, I fill the bottom of the mesh planter with a thick layer of perlite, then added some gardening soil on top. The perlite helps make the soil less compact which is good for the roots. 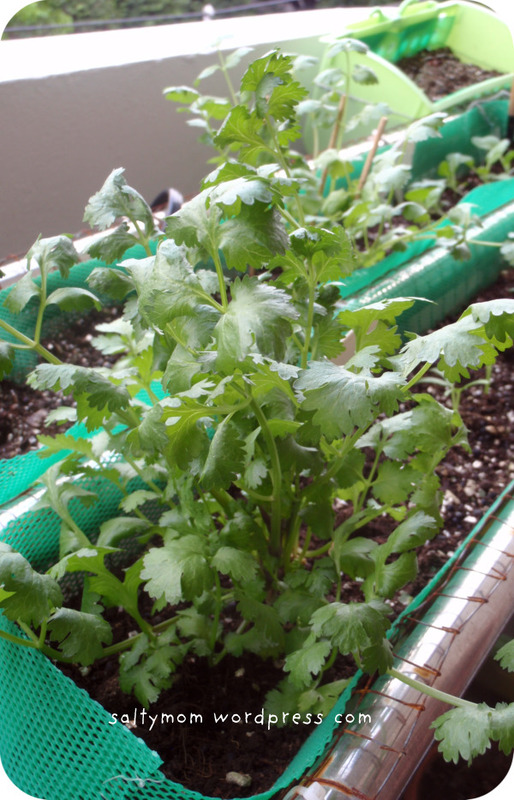 It also retains water for the veggies to feed on till the next watering and it is lightweight. The soil was just 4 inches deep, so I have my doubts on whether it will work , given my track record. I was surprised when the lettuce came out. They never grew into those big heads of lettuces found in superstores but they were enough for my egg omelet soup, and sandwiches. There were two heads of Chinese cabbage down the rack that grew to size. I didn’t have the heart to eat them. One whole packet of seeds and only one sprouted ! However, this single plant provided all the parsley we need for 2 months. I think the easiest veggie to grow is the spinach, both the green and red variety. Baby pak choy also did well. 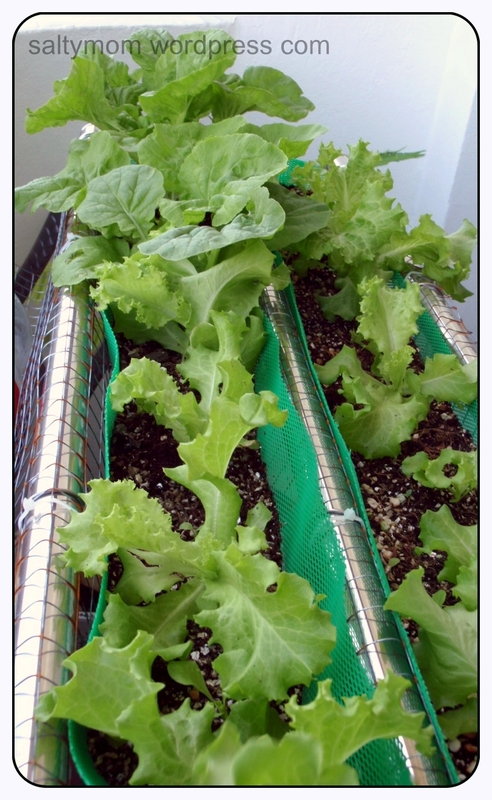 Even if you have a little space, a little soil, you can still grow food. For this type of planter, you need to water every day, and add compost every week or so. One thing though, this planter will drip and make nasty puddles. You may want to add a tray to catch the water. I just put some low maintenance plants underneath. Wow! 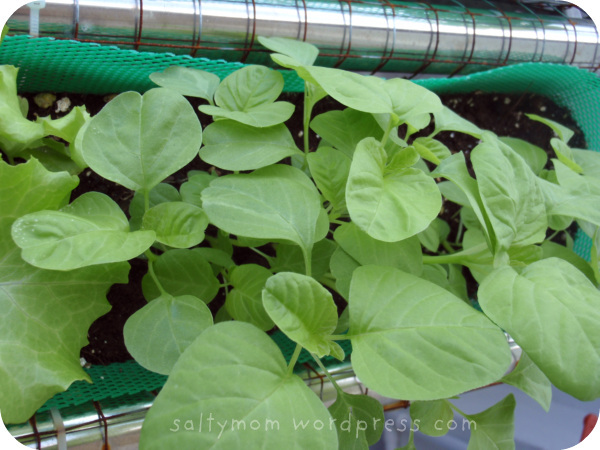 You have such a magic green finger….really inspire me to plant too! But the weather here is quite hot…what temperature weather you have there?